This historic book is recommended for children ages 8 and up and is a read they are guaranteed to love. It combines great adventure with even greater values – kids won’t even realize they are learning about history! What a story and testimony of trails and faith. We listened to the sound track from the movie first before reading the book. The song Alone Yet Not Alone sung by Joni Eareckson Tada is sure to touch many to the point of tears. I know it sent me to prayer. Being the Historical Fiction lover I am and loving it when story is based on truth, I just loved this book. As I read it to the children they too loved it. It led us to know that we truly do not have life hard today. The Author Tracy Leininger Cravens book weaves the tale of her family’s history so well and I just love the way she describes the setting and the account of happenings set back in 1755. I love that this family had such a strong faith in God and it showed in their daily living. I love the Fathers leading of the family through his words of faith though he knew they would have trails to deal with. I loved the Mothers strong sense of duty to her family and her love for her children. I also loved the faith the children had for parents in this story. This is a story of Courage, Faith and learning to fully trust God in all of life. I hope you will get a copy of this book and read it to your children so that they can see and know that Faith is never to be taken for granted and life is to be lived in sincere and true faith toward God and others. We can’t wait to see the Movie in June ! Leave me a comment here on this post This week , to be entered in a drawing for a copy of this book ! Winner will be announced early next week ! This entry was posted in Book Reviews, Giveaways, Reviews and tagged Alone Yet Not Alone, Faith, Giveaway, Tracy Leininger Craven on April 29, 2014 by Linda Marie Finn. Julia Roller is an author and editor. Her books include Mom Seeks God(Abingdon Press), A Year with God (with Richard J. Foster), A Year with Aslan, and 25 Books Every Christian Should Read. Working with Renovaré, she has also co-authored four spiritual formation guides. She has written study guides for authors such as Desmond Tutu, Richard J. Foster, Henri Nouwen, Jenna Bush, and Rob Bell. Her articles have appeared in The San Francisco Chronicle, Street Spirit, Group, Rev. !, and Children’s Ministry. She and her family live in San Diego, California. I am so glad that I was chosen to review this book. I know now that the Lord wanted me to read this at this time. I was searching for time to be with the Lord and searching for a better way to teach my children about God and his love. One of my fondest memories was of my mom reading her bible sitting on the couch. So I wanted my children to have the same memories of me and if they remembered one thing about me I wanted it to be that I loved Jesus and had a personal relationship with him. One in which I spent time in the Word and Prayed and they saw me doing these things. But it seems that life always somehow gets in the way at times from allowing me personal time with the Lord. And surely I needed to practice Grace even in times of chaos ! If you seem to find no time to be personal with the Lord, this is the book for you. Julia shares with you how to make those things real and happen in your life. You will learn how to make God a habit. How to let others into your life. You will read about real submission and God’s will. How to build a firm foundation through study of the Word. How to turn off everything and How to get with God and receive his gifts ! I hope you will take time to get a copy of this book and let it sink deep into your heart and mind. Let it transform your day and your life ! Julia is celebrating the book’s release with a fun giveaway and connecting with moms during a live Facebook author chat. Enter today by clicking one of the icons below. But hurry, the giveaway ends on May 1st. Winner will be announced at “Moms’ May Day” Facebook Party on May 1st. Connect with Julia for an encouraging discussion on spiritual discipline and finding joy in the middle of motherhood. Win prizes, connect with other moms, and be inspired. Don’t miss a moment of the fun; RSVP today. Tell your friends via Facebook or Twitter and increase your chances of winning. Hope to see you on the 1st! 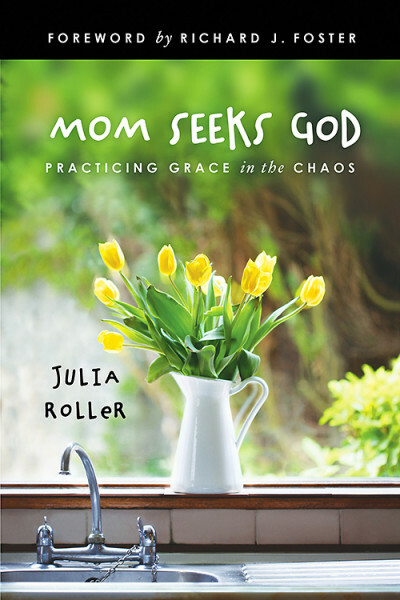 This entry was posted in Book Reviews, Reviews and tagged Faith, Finding Time with God, God, Grace and More Grace, Grace in Chaos, Jesus, Julia Roller, Mom Seeks God, Moms, Study, The Word, Women on April 28, 2014 by Linda Marie Finn.